I got up early last Saturday morning, hoping to capture some photographs of the Niobrara Valley Preserve in the light of the sunrise. Unfortunately, the skies were cloudy, and the sun stayed stubbornly behind them as it rose above the distant hills. The light reflecting from the prairie and adjacent woodlands was dull and muted – not good conditions for photographs. The Nature Conservancy’s Niobrara Valley Preserve, Nebraska. 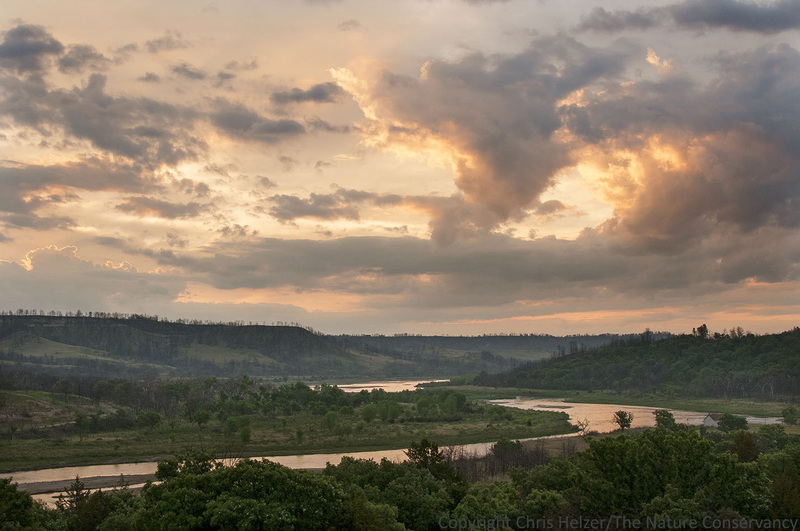 This entry was posted in Prairie Photography and tagged image, nebraska, niobrara river, niobrara valley preserve, photo, photography, sunrise by Chris Helzer. Bookmark the permalink. You just never know what the lighting will be until you get out there and stay awhile. It can change in an instant! Well worth the wait! Beautiful view….. love Nebraska’s pretty scenery! Gosh Chris! This is stunning.